Tissue MicroArrays (TMAs) have become a common method for efficient high capacity analysis of tissue samples. This kind of technology allows to enclose up to a thousand tissue samples into a single block. Resulting blocks are arranged in arrays and can be categorized by its users. As a result, you can analyze the samples by using certain detection techniques. As it is common way of analysis, using this method has many advantages. Such as increased working speed, higher capacity, standardization and ease-of-use. Also provided protection of valuable sample and keeping the cost of analysis as low as possible. Beginning with immunohistochemical detection of protein in tissue sample. Atomic transformation frequency analysis in different tumor types. Antibody color condition optimization. Ending with testing and evaluation of prognostic markers. – Typical applications include such steps. Publications about the technology and discussion of applications and limitations can be found on our Recommended Reading page. 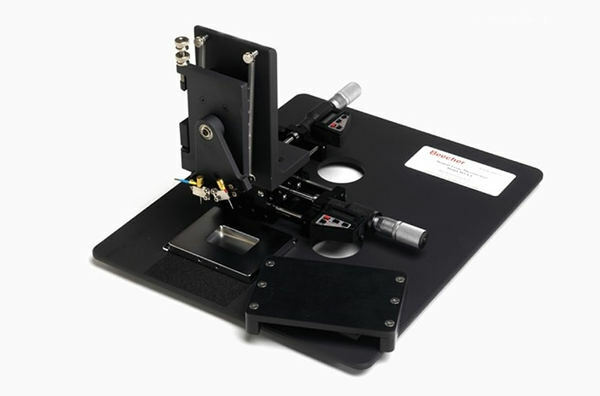 What is more, Our tissue microarray instruments are designed and developed by Beecher Instruments. Therefore, these instruments allow you to inspect multiple slides that contain hundreds of individual tissues. Instead of inspecting samples one slide at a time, tissue microarray allows you to work with hundreds at the time. For example, an analysis from 600 different tissues can be completed with just 1 day. MTA-1 is the equipment necessary to start up a productive TMA facility. It is an affordable, manually operated and highly accurate arraying equipment. Skilled users can create arrays with more than 500 samples per slide with this unit. Measure block heights, retrieve donor tissue cores, create holes in paraffin matrix and deposit tissue cores into holes. Forget about doing those things manually. Everything is automated. As a result, the work can be done easier and quicker. ATA-27 is targeted for laboratory useage for its higher capacity. What is more, planning and designing the array layout can be done by using certain software. Contact us to get more information about our tissue microarray instruments and accessories.